An agreement for a JV, operated through a company formed for that specific purpose.The project that will be undertaken could be anything. Examples are: a property renovation, design and creation of a consumer product, or buying a company in order to sell the assets. Because the company is likely to focus on achieving a single outcome, particular emphasis is placed on exit arrangements, including re-structuring. 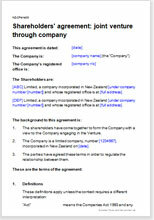 This document regulates a company set up for a specific joint venture project. Although the company will be an independent legal unit, the venturers will want to know what is happening and will exert closer control than if they were mere shareholders in an associated company. It is assumed that the venturers will be two companies, but they could as easily be three or more – individuals or any other entities. This agreement is about control, co-operation and management. It is as suitable for research project as to construct a road or export goods abroad. There is no specific cut off between a joint venture company and any other in tax laws and other areas. A shareholder agreement is an essential document for partners in a JV, more so if contributions of time, expertise, money, use of assets and intellectual property brought in are not in equal proportions. A JV is also likely to be time or outcome limited, compared to a normal company that is likely to be expected to continue trading into the long term future. After the goals of the venture have been achieved, the owners are likely to go their own ways and disband the company. This template helps the parties to identify and deal with the most likely points of dispute. Given the nature of joint projects, we have provided particular emphasis on deadlock resolution during decision making, transfer of shares, and exit arrangements. This agreement is drawn by a solicitor with experience of problems that can occur in the management of a JV company. Note: It is important that the constitution of the company is in terms that permits and supports this agreement. This document contains commercial paragraphs as well as what you might call technical legal provisions. You can choose which are suitable for your needs. Many are based on our practical experience as solicitors of dealing with shareholder disputes.